Chris Metzen and Andrew Chambers sat down at BlizzCon to chat about the lore and story behind the universe of Starcraft II. As we saw in the gameplay panel yesterday, Blizzard is aiming to really break a lot of new characters into the foreground using the adventure game-style cutscenes, and Metzen and Chambers seem really excited to bring some new faces into the RTS staple sequel. To start off the panel, they ran through a few of the folks we'll meet in the Terran campaign. Dr. Hanson is a "Dr. Lady with glasses (so she looks really cute)," said Chambers -- originally she was designed to be a male citizen kind of person (someone the player just helps to make their way through the campaign), but they moved on to try and make Jim Raynor (Starcraft's protagionist) a sort of romantic interest. As much of a romantic interest as a hard-bitten mercenary can have, anyway. Lots more from the SC2 lore panel below. Rory Swann is the ship's engineer, a rough and tumble New York accented guy who's running Raynor's ship (the main hub for most of the Terran missions). 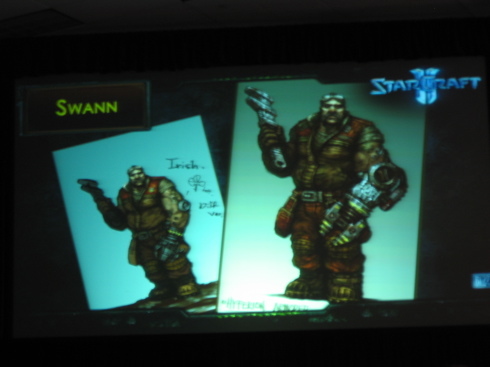 Raynor got the ship in the Starcraft novel the Queen of Blades, and Swann is the real soul of the vehicle that flies around the universe at faster-than-light. They showed off 3D renders of all the characters, used in the ingame cinematics. They aren't quite as good as the actual prerendered cinematic models, but they did look good. And Chambers told us that they could actually use the models in a game, if shrunken down to match the size of the RTS designs. Tosh is an arms dealer on Raynor's ship -- he's a rough Jamaican dude with a sniper rifle. He's got a connection to another popular Starcraft character, Nova, who was meant to be the main character of the canceled Starcraft: Ghost game. Metzen described him as a Boba Fett-type character, "although," he said, "Boba Fett wasn't really used that well anyway." 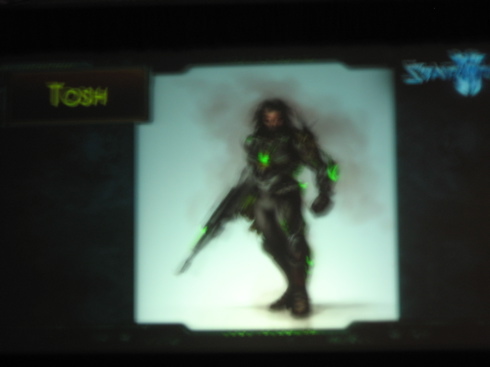 Tychus Findlay is an old buddy of Raynor's -- we saw him in the cinematics shown at the gameplay panel yesterday. He's important as a key to Raynor's past (he and Raynor were "thick as thieves," before Findlay went to jail and Raynor became a marshall on a far-out planet). Plus, said Chambers, "we can show a big chunky guy in marine armor. Which is important to us." Metzen realized with regret that when it comes to Starcraft names, they're usually dependent on just a few letters: "It's either A or T names with us. Dammit!" Matt Horner is another figure in the Terran campaign, a ship captain who's straitlaced and heroic, kind of a good angel on Raynor's shoulder as opposed to the bad influences of Tosh and Tychus. 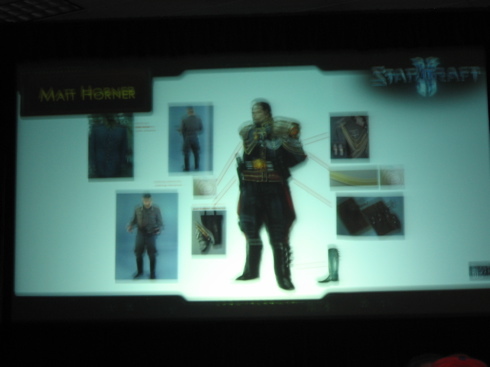 Horner is a young guy, but they wanted him to be very military, so they borrowed inspiration from old fascist uniforms. Finally, Valerian Mengsk, son of Starcraft's famous Arturus Mengsk, also gives some missions to Raynor as he goes along on the Terran campaign. Arturus, says Metzen, is pretty much lost -- he's leading the Dominion, he's got too much history with Raynor to be a part of the campaign. But Valerian is not quite sold on his father's empire, and he's willing to deal with Raynor... for now. Those were all the characters they showed. A Q&A session followed, and Metzen and Chambers answers all kinds of questions about the story of Starcraft. One fan asked if there would be minicampaigns in each of the games (as announced yesterday), and both authors said that yes, there will be multiple divergences in all of the campaigns, where you'll get to try out other races. They talked about influences as well -- Metzen admitted that both Firefly and Dune have set up a lot of the universe that Starcraft II inhabits (though he admitted that Starcraft did "rednecks in space" way before Joss Whedon ever tried it). The Xel'naga were mentioned -- Metzen confirmed that the ancient race will be part of the backbone of the trilogy. The Terran and Zerg campaigns will poke around the overarching story, but it will really come to fruition only in the Protoss campaign game. They also told an entertaining story about Kerrigan, Starcraft's alien queen (who used to be a Terran Ghost): while trying to come up with characters for the original Starcraft, Metzen and his partner were playing a lot of Command and Conquer, and in that game, they have a female secret operative named Tanya, apparently. So when Metzen was naming his female secret operative, he though of a few figure skaters who'd been dueling at a time, and the Ghost who would eventually become Starcraft II's big bad was named. Finally, Metzen answered a question that's on most fans' minds about the big reveal this weekend: was it the right decision to split the games up? Metzen thinks it was. "As a fictional event," he said, "we can make it like the coolest science fiction thing ever seen in a videogame. Did I just say that?" he asked, and the crowd in attendance applauded. "The freedom is amazing. And you guys are really going to see it. This stuff that we're doing now, Diablo 3 and Starcraft II, is easily the best stuff we've ever done as a virtual experience... Warcraft III doesn't even rate as a Saturday morning cartoon to the themes we're dealing with in these games. I think it's great, and I hope you all agree when it comes out."